Oriental chicken served with long grain rice. Cut the chicken into 2cm strips and marinate for 15 minutes in a bowl with the soy sauce, five spice, the juice of ½ lime and some seasoning. Cook the rice according to packet instructions. Meanwhile, halve the courgettes lengthwise, then cut into slices. Heat 1 tbsp oil in a wok until very hot. Add the salad onions, courgettes and garlic; season. Stir-fry for 2–3 minutes, then set aside. Wipe the pan clean and heat 1 tbsp oil. Take the chicken from its marinade and stir-fry for 4 minutes until cooked through. 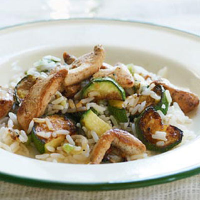 Toss the courgette mixture with the rice and chicken. Drizzle over the remaining lime juice and serve immediately.